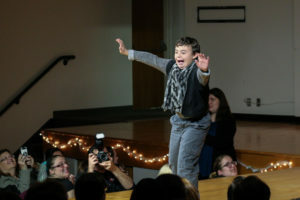 Dress Up for Downs’ fashion show was held on Nov. 18 at Rockwell Hall. All 14 models walked the catwalk wearing clothing designed by Kent State’s very own. All of the proceeds from the night went to Dress Up for Downs’ parent organization, The Upside of Downs. Family, friends and students filtered into the auditorium full of chatter, as the Dress Up for Downs team prepared for the start of the show. People were standing in the back, splitting up between rows and sharing seats, all to watch the Down syndrome models walk the runway. The show began with a video introducing each model mentioning what they were most excited for. The crowd clapped and laughed along with the given responses. Sarah Petit, the president of Dress Up for Downs, began by explaining how the student organization started and its mission. The Dress Up for Downs student organization began in spring of 2016. Sarah started the organization on campus over a year ago, and since then, the organization has been successful in fundraising through different events for its cause. Kent State fashion designers teamed up with individuals with Down syndrome to create age-appropriate clothing they feel confident in. Through pairing with The Upside of Downs, they are able to raise awareness for people with Down syndrome on campus. The video screen retracted and the stars of the show appeared. One after another, the models were escorted out by members of the Sigma Nu Fraternity and Kent State special education students. The models were able to walk down the runway to a song of their choice. The models were smiling ear to ear, waving at family members in the crowd and in some cases, giving high fives to members of the audience. Each model had their own unique walk, poses and style. Some wore pieces designed after celebrities and TV show characters. One of the designers, Nicole Schnabel, followed the theme of the night with her designs. The crowd was laughing with each model. Some were silly, some were sweet and some were serious about strutting their stuff. Family members and friends snapped pictures from their seats with pride. Shane Guhde, who was sitting in the audience, said his favorite part of the event was simply seeing the models so happy. “I am really happy that we were able to help raise money for such a good cause and that so many people got to feel so special in their outfits,” Guhde says. The 50/50 raffle raised $218 for the organization after the winner decided to donate his winning back to Dress Up for Downs. The silent auction, ticket sales and raffle combined helped Dress Up for Downs donate $2,108 to The Upside of Downs. After the initial total was announced, an anonymous donor rounded the donation to $3,000. Petit seemed overjoyed with the success of the night. The night ended with a red carpet and photo backdrop in Rockwell’s lobby where the models, family and friends could take pictures. Designers and their models gathered around to mingle and take photos. 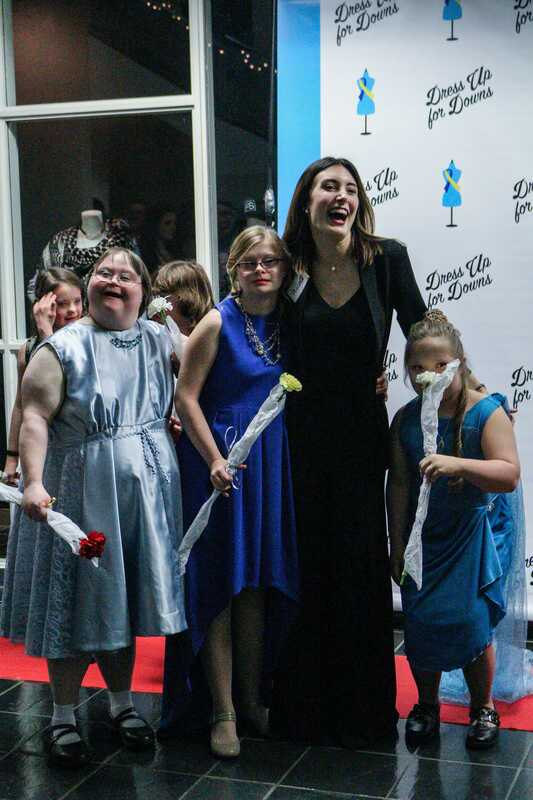 The backdrop displayed the Dress Up for Downs logo and made the stars shine even brighter.